Ruby Has will debut a sneak preview of its new "Tantrum" video ad campaign at Ecommerce Operations Summit 2019, to be held April 9-11 at the Greater Columbus Convention Center in Columbus, OH. The video will be shown continuously at Ruby Has's booth #218 during the show. 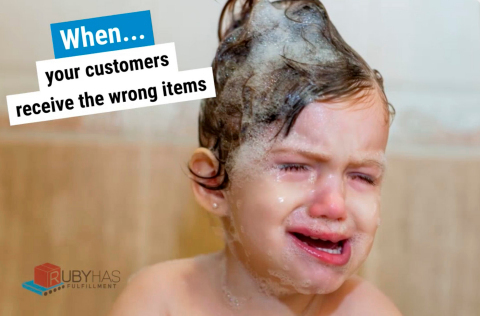 The video ad campaign, which will launch on April 15, focuses on the major frustrations that direct-to-consumer brands face as they navigate the fulfillment aspect of their ecommerce operations, and features a series of over-the-top comical tantrums each resulting from a specific problem or frustration, then highlighting how the company has overcome that challenge for its customers. "As an ecommerce fulfillment company enjoying three consecutive years on Inc. 5000's list of fastest growing companies and listed on Crain's Fast 50, serving hundreds of name brand D2C companies, we at Ruby Has have been able to solve many of the chronic difficulties that have been inherent in ecommere fulfillment for direct-to-consumer brands, from late or imprecise shipment to inability to scale with growth," said Esther Kestenbaum, President and COO of Ruby Has. "This video ad campaign acknowledges these problems and shows it's entirely possible to do much better and in fact, to provide excellence. D2C companies need not suffer." "We use fun and humor as an empathic means of sending our message to D2C brands - a message that we understand their pain, and as part of our overall ethos of lightening the business and mental load for our customers so they can focus on their core business, which is really what we do as a company," added Claire Bretzke, Director of Marketing at Ruby Has. "This is exactly the kind of informative and enjoyable content that can be found at our flagship event," said Mike O'Brien, senior content manager for Multichannel Merchant and lead programmer, Ecommerce Operations Summit. "We're thrilled to have Ruby Has launch this at our event and look forward to lots of great insights, learning and networking with our audience of operations and fulfillment professionals." Although the campaign actually launches April 15, Ruby Has will be playing the full initial campaign at its booth. Popcorn will round out the informative and actionable edu-tainment viewing experience for booth visitors. About Ruby Has: Ruby Has is one of the fastest growing ecommerce fulfillment providers (ranked by Crain's Fast 50 in 2018 and Inc. 5000 for three consecutive years) for direct-to-consumer brands and retailers, fulfilling their brand promises with precision, customization and excellence at scale. They are the preeminent global fulfillment platform, providing an enterprise level end-to-end supply chain ecosystem to omnichannel brands regardless of size, customization or scale. Where others "break" and fail at scale, Ruby Has shines. Brands can boost their customer satisfaction with a full-service fulfillment provider that walks alongside their brand as a committed partner. Ruby Has Fulfillment leads the third-party logistics (3PL) industry with cutting-edge technology, seamless integrations, and an uncompromising commitment to quality. Four warehouse locations across the U.S. and Canada allow growing brands to ship faster and reduce freight costs by up to 45% with bicoastal fulfillment solutions. About Ecommerce Operations Summit: The Ecommerce Operations Summit provides insight and ideas to help your entire DTC operations achieve efficiencies and improved customer experiences. From warehousing and fulfillment operations, contact centers, inventory and order management to pick, pack and ship, delivery and returns, technology, automation and systems integration, transportation and global operations, we've got it all covered. If you want to get more efficient, make customers happy, reduce costs, develop and retain the best people, ship faster and find the right technologies and vendors, this is the annual event for you.